The cookbook author says she doesn't want to be a celebrity chef—"I’m just a mom trying to get stuff done." 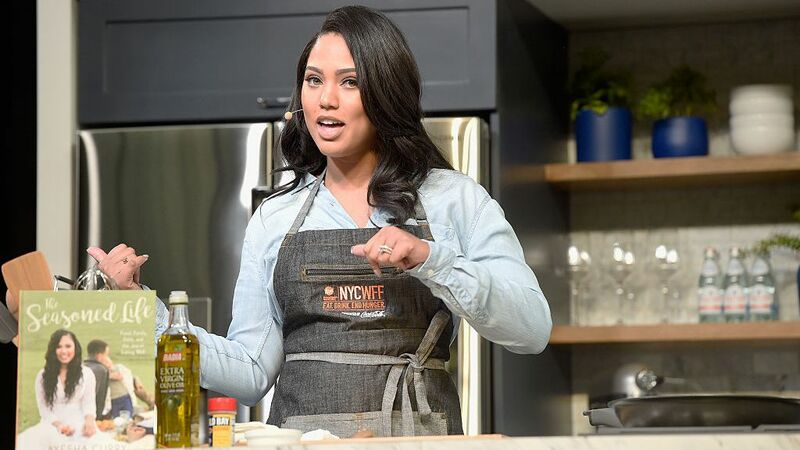 Ayesha Curry—outspoken Christian, mom and sous vide-enthusiast—is about to embark on the second season of her cooking show, as her husband Steph Curry prepares for the second round of the NBA playoffs. 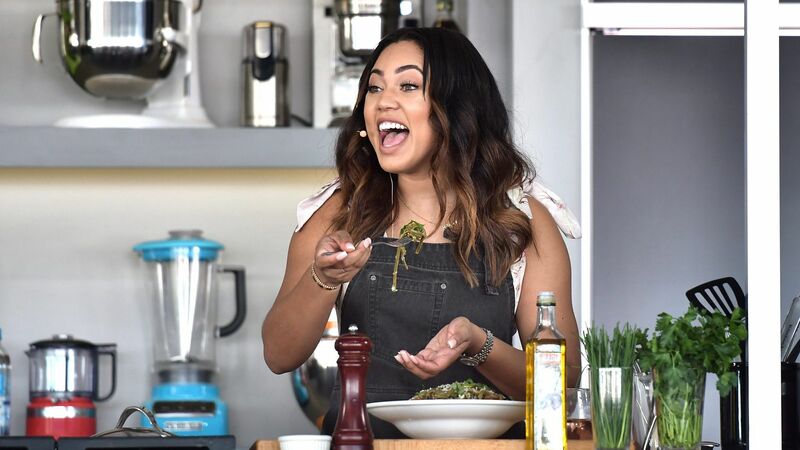 Before Ayesha’s Home Kitchen returns on April 30, TIME spoke to Curry about making religion part of her brand, what she sees as the most overrated food (hint: it has a magical horn) and whether her relationship is as wholesome as it seems. In a world with a lot of cooking shows, how do you set yours apart? This season I wanted to share more recipes and have more fun with food. So for every recipe, we do about five dishes and there’s always a hack to make people’s lives easier. I want people to feel like food doesn’t have to be fussy, and you can entertain while you’re cooking. So I always have somebody in the kitchen with me, whether it’s a family member or a friend, and we just have an absolute blast. Why is there so much appetite for celebrity chefs and cooking shows? I have no idea. For me personally, it’s always been a dream of mine and something I’ve been working towards. But I’d rather nobody think of me as a celebrity chef. I’m just a mom trying to get stuff done. And that’s my whole thing. I just want to make food fun and approachable, though I actually know what I’m doing because I do have some training. It seems that whether you like it or not, some people will think of you as a celebrity. What are the best and worst things about being able to command public attention with a single tweet, whether it’s about women’s fashion or how the NBA is run? For me, I take it all with a grain of salt. I don’t worry too much about the backlash, and I stand behind everything I do. It’s also really cool, at the same time, to be able to have a platform where people somehow want to listen. And I’ve been lucky enough to be able to use my platform to do what I love. You’ve been critical of President Trump’s proposed budget cuts for kids’ food programs. Do you worry about weighing in on politics in such a tense climate? There’s always a line but if you feel passionately about something, that’s one of our First Amendment rights, right? Freedom of speech… You’ve got to read everything, so you can and form your own opinion. That’s where I am now, always learning, always reading, always trying to figure out what I believe. What do you think is the most overrated trendy food right now? The whole unicorn thing. All we’re doing is putting food dye into everything, and I just wonder what our intestines look like at this point. Does it look like a rainbow of fun? Sous vide. Especially with how many at-home sous vide machines there are on the market that are actually affordable. I feel like it’s such an innovative, cool way of cooking. Perfect steaks. Perfect everything. And meal kit services. I started my own, and I’m sure everyone is like, ‘Oh, we’ve seen this before.’ But mine is different because it caters to families. Your brand is very family focused and also outwardly about faith and religion. What do you find most challenging about mixing religion and your role as a public figure? I’m a Christian, and people are very misinformed on what Christianity is. They expect these certain things out of me. Like, “Oh my god, she has a glass of wine.” I’m not ashamed of my faith at all. I’m proud to put it out there, but I’m never pushing anything on anybody. That’s never been the message, to push my beliefs. But it’s a huge part of who I am and I’m proud of it. So whenever I get the chance to talk about it, I do. Many of your fans are millennials, who are much less religious than older generations. Fewer believe in God. Why do you think we’re seeing that trend in America? Maybe it’s how much access everybody has to everything. And everybody’s preoccupied. We’re in a time where pop culture has, unfortunately, become people’s religion at times. It’s a scary thing. I feel like morals have lessened. But as long as my family is doing what I feel is right, that’s fine. I’m not going to judge anybody on what they feel is right. That’s not what it’s about. There’s a perception of you and Steph being a couple that is more wholesome than the stereotypes you hear about famous male athletes, that you’re bucking a trend. The truth about that is that we are different. We’re not the norm. And that’s fine. I don’t think that’s something that needs to be blasted out to the media. That just is what it is. Even our friends tell us that who are in the industry. We’re everybody’s little sister, we’re everybody’s little brother, and we’re fine with that… We are open about our faith, but we’re homebodies. HGTV, a glass of wine and our kids make us truly happy. We really enjoy each other’s company. So our togetherness has kept us going. Does fame and celebrity ever cause tension for you two as a couple or a family? No, because behind closed doors we don’t talk about it, we don’t look at it, we don’t think about it. We’re just completely normal when we’re in our home and when we’re with our family. It just happens to be a part of life. I do wish we could go to Target as a family, but that’s about it. For Americans, eating healthy and maintaining a healthy weight are popular topics. What do you think people can do to eat better? It’s remembering everything in moderation. People get on these diet fads and then they rebound and then end up spiraling into deeper, more complex, worse eating habits. When you have a craving, fill that craving, but don’t have a whole box of Krispy Kremes. That’s been a part of my journey, remembering portion control. I’ve actually lost 17 lbs. since January 1, so I’ve been really happy. I’ve finally got the rest of that baby weight off. But it’s been a journey, and I did it very slowly. I was looking for a lifestyle change, and I think that’s important for people to remember. So just limit how many Starbucks Unicorn drinks you have each day?